Shred360 celebrates its 12th Birthday this year! We need “YOU” to help us celebrate by creating a new 12 Year Birthday logo for us to use. Be Creative! You never know where you may see this logo…you might even see it on one of our shred trucks! 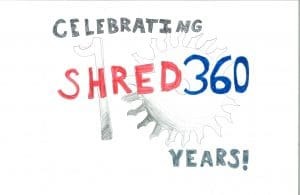 What: Design a new Shred360 logo to celebrate our 12th Birthday. You may design your logo on paper or by computer. When: All entries must be submitted on or before Friday April 12th, 2019. The winner will be announced on Monday April 29th, 2019.